Jinnah Golf Driving Range, Lake View, Islamabad. 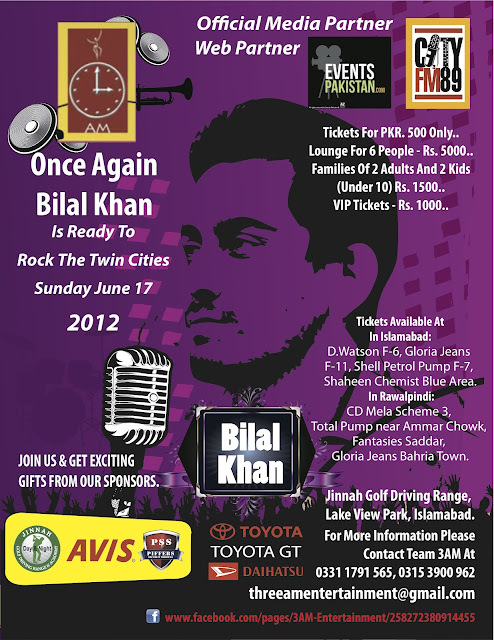 After the mega success of Coke Studio Season 5, 3AM Entertainment brings to you Bilal Khan - Live in concert ! Once again .. Bilal Khan is ready to rock the twin cities ..
Tickets for PKR. 500 only .. Families of 2 adults and 2 kids (under 10) Rs. 1500 only ..
VIP Tickets - Rs. 1000 only .. Lounge for 6 people - Rs. 5000 only ..
Tickets would be available in the market from next week .. Stay tunned for locations ..